This month has been a bit chaotic what with my having a touch of some kind of bug and my brother-in-law having to be put in the hospital. I’m still recovering, and he should get out today or tomorrow. So hopefully all will settle down soon. I quilted this 4-patch with stars and loops in black thread. It is a big queen size quilt and now ready to deliver to the church pantry. I also made a small quilt that can either be a lap quilt or a baby quilt. It was a favorite of my quilting group. And I finally got to use the Tri-Recs rulers I found at a garage sale for $2 a few years ago. This pretty quilt will also go to the church pantry. I chose backing fabric from my stash for a throw size scrap quilt that I started last month. The backing is loaded on the longarm, but quilting was put on hold until I pick up the batting I need for it. I will be playing with some custom quilting in the 6″ white squares. And then before I knew it, this doll quilt top was together. These quilts put me a bit closer to my goal of using up all the 2 1/2″ squares and strips that I have cut. 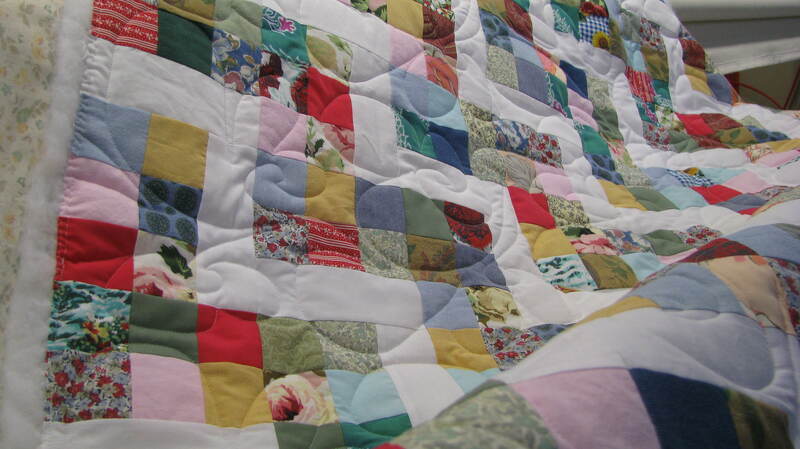 And I got three more rows of the Rainbow Garden Log Cabin quilt together. Because this quilt top is rather heavy with all that paper on the back of each block, I am constructing it in two halves and will sew the halves together later after most of that paper is removed. It’s slow, but I’m getting there. In addition to the additional rows sewn together, I now have all the border appliques cut for this quilt. Last Sunday afternoon, I altered the length of a dress for my granddaughter and added elastic at the waist to give it some shape. I would have gotten before and after pictures, but this 3-year-old was not feeling cooperative that day. Out of the fabric that I cut off the tail of the dress, I made her a scrunchy for her hair. Very easy and quick project. I cut and adhered all the poinsettia appliques to 14 placemats which are Christmas gifts for this year. Stitching them is next. These have way more pieces than last year’s pumpkin placemats so will likely take a lot more time to stitch. I best figure out a schedule for how many to complete each month so that I have them done by Christmas. I’m thinking that I may also do a thread color change on this one. Or I could do it all in a deep forest green. Decisions, decisions! In spite of February being a short month and me being gone a lot to watch my granddaughter’s last season of basketball, I managed to get quite a bit accomplished. Enjoy! I was searching in my sewing closet for something, can’t remember what, but discovered that I hadn’t yet quilted the Zigzaggy quilt. So I pulled it out of the closet, found a piece of fabric in my stash large enough to make a backing, pieced some batting together, and loaded everything on my longarm. I decided to try one of my pantographs that I had not yet used and chose one called Baby Curls. And I loved it not only for how it looked on this quilt but for how quickly it went. I had this large throw size quilt on and off my frame in about 2 1/2 hours. Fastest quilt job I’ve ever done. Then I got busy and used the rest of the afternoon to bind it. My first finish for the month and a bit closer to meeting my goal this year of using up all those 2 1/2″ squares and strips I cut over two years ago. You will be hearing a lot about my meeting this goal because there were way more of these pieces than I figured on and although I used up a great many of them last year, there are quite a few left to go. In fact I’ve already started two more scrap quilts out of them. This one is awaiting borders, quilting, and binding. And the other one is taking up the left half of my planning wall. In fact it is pushing me to get the remaining blocks sewn together for the Rainbow Garden Log Cabin quilt which is taking up the right half of my planning wall. You see, Rainbow Garden is tedious to work on, so I procrastinate. And because I need more space on the planning wall so I can add more blocks to the scrap quilt on the left…..well, you get the picture. I do have 8 rows of Rainbow Garden sewn together, and I am really liking how it is looking. I did check off one of my goals for 2019 as completed – the cover for my Sizzix eclips2 cutting machine. I used a 7 inch circle to make the arched pieces at each end and then just cut a rectangle the size I needed to go over the top of the machine. I cut and sewed the lining first testing and adjusting for fit as I went. Once I was happy with the fit, I cut and sewed the cover, added the lining, and, tada!, a bright and cheery cover for my machine was done. I hope that your February was productive and fun, and here’s looking forward to seeing what we can get done in March. Did January seem short to you? Well, it was for me in the amount of time I had for crafting. I started out the month just fine. Then caught a nasty cold that lasted a full two weeks. I’m still coughing some from it. I’ve had others tell me that they were still coughing 6 weeks later. And it is extremely contagious as most of my family has had it or are just now getting it. Hope you escape this one. Now on to the remainder of January. I managed to get three rows of the quad Log Cabin blocks together. I’m really liking the way it is looking, and I’m anxious to get started on the appliqued borders. But, alas, I have to wait until all 192 blocks are together before I can measure and cut the border strips. I also got the backgrounds plus the borders of the Poinsettia placemats together. Next step is to start work on the appliques. I spent several days this month on the phone with a technician at ABM International trying to get my Innova longarm stitching well again. With his help I learned a great deal about my machine and got it back on track. So then I got busy finishing the quilting on Fading Charms. It is now bound and ready to go to the church pantry where it will be given to a needy family. It gives me great pleasure knowing that something I love to do will help to keep somebody warm. And didn’t this one turn out neat? I also got the Apple Core/Double Axe head quilt finished. I guess I better tell you where the quilt top came from. When I delivered some finished quilts to the church pantry a couple of months ago, one of the workers showed me this quilt top and asked if I could finish it for them since they couldn’t find a home for it in its current state. I agreed even though it was double-knit which I had an inkling would be difficult to work with. And boy was it ever. It stretched and crawled and tucked even though I worked very hard to keep it from doing so. 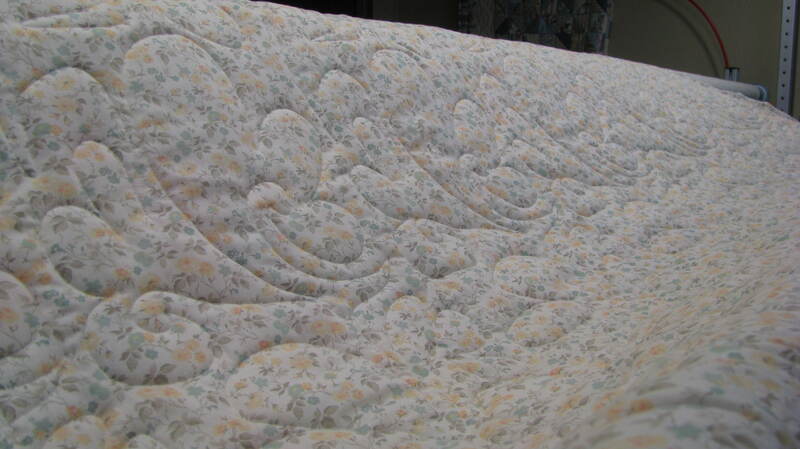 I eventually got it quilted but wasn’t happy. Definitely not my best work. But I promised I would finish it, and finish it I would. 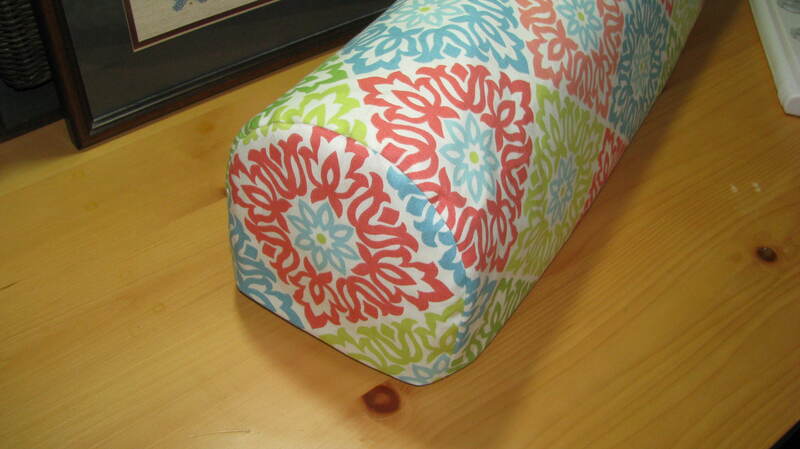 I decided to use a red and white striped fabric to make the bias binding for the curved edges. Took me four days to do that binding and has me questioning whether or not I will ever do another. But I think the binding adds a bit of fun to this quilt that was rather difficult to work on. I’m glad this one is finished and on its way back to the church pantry. But it did turn out cute and will keep someone warm. Now back to the quad Log Cabin quilt and the placemats. I get to play with my Sizzix eclips2 cutting fabric appliques. I’ve done one test run but have a lot to learn about this machine. By the time I get all the appliques cut for both of these projects, I will be a pro. And I have no doubt that I’ve forgotten to list something. To see and read about all these projects, just scroll down through the past eleven months of my life. I have 192 quad Log Cabin blocks that need to be sewn into 16 rows of 12 blocks each and those 16 rows need to be sewn together. I have finished sewing the first row and have started the second. I think that I will just jump on this and get it done. It is actually going faster than I anticipated. When all is together the borders need to be cut to size and the appliqués put on them. Then there is the quilting and binding and labeling to do. I really would like to complete this quilt by the end of 2019 but am thinking that I may be setting my goals a tad too high since I like to mix in other projects as I go along. I have 14 appliquéd placemats to make. The background squares are cut and ready to sew together. I have a quilt on my frame to finish quilting and three in the closet to quilt. And after they are quilted, there will be bindings and labels to do. 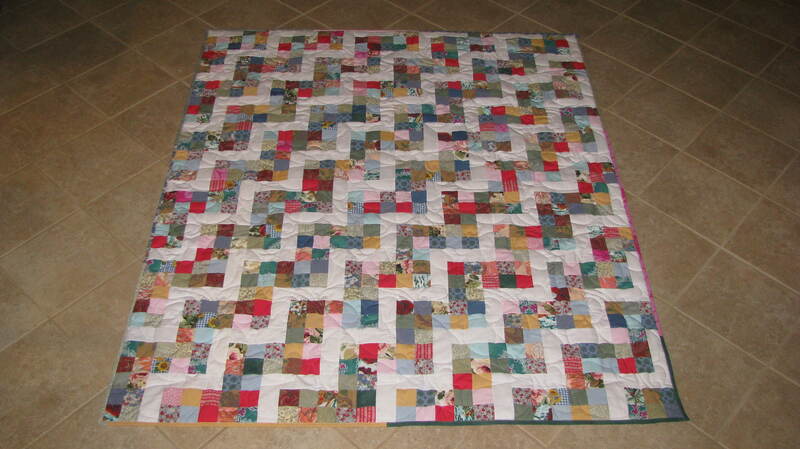 I want to use up all the 2 1/2” squares and strips I cut from thrift store shirts, skirts, etc. They will be sewn into quilts that will be donated. I’ve already chosen a pattern for the next one. Just need to decide what neutral color to use for the background. I have a bolt of white in my stash. That always looks nice. I’ve chosen a piece of home décor fabric from my stash to make a cover for my new Sizzix eclips2 electronic cutting machine. I need to do that right away to keep the machine lint and dust free. And I want to take more online quilting classes. I paid for a subscription and would really like to take advantage of it. What do you think? Is there enough time in 2019 to do all of this? One thing that should help is the Sizzix eclips2 I got for Christmas. This machine will save me time in cutting out all the appliqués I need for the placemats and the Log Cabin quilt border. Stay tuned to find out how it goes. For the past 9 years, we have hosted Thanksgiving dinner for all of my family. Anywhere from 18 to 25 people showed up each year. This year we had to cancel because my husband got sick. He couldn’t get in to see the doctor until the afternoon before Thanksgiving Day to find out if he was contagious or not. Turns out he was not contagious, so our daughter, her husband, her daughter, our other two granddaughters, and our great-granddaughter came and spoiled him. We had a very nice relaxing day. I now have a total of 177 blocks stored in that nice big white box waiting for the remaining 15 blocks to be completed. I actually have the fabric pressed, cut, and ready to start sewing them up. In fact, I have pieces for 17 blocks just in case I don’t like the way a block or two looks in the quilt when I get everything laid out. Square Dance is finished! It turned out quite pretty for just a bunch of cut up shirts, skirts and dresses. Did you notice that I made good use of more scraps in the scrappy border and binding? I also finished the Fading Charms top and have it on the longarm frame. Now if I can get my longarm to stop breaking threads, I’ll get it finished. Need to put in another call to the 24/7 hotline to continue trouble-shooting the problem. And I finished another quilt top that I’m calling Zigzaggy. It is hanging in the closet awaiting its turn on the longarm. I’ve been shopping for fabrics so that I can get started on 2019 Christmas gifts. I did the pumpkin placemats for 2018 and will be doing appliquéd poinsettia placemats for next year. I have some of the background fabrics and the reds for the flowers and berries. I also have some fabrics that I can use for backings. Still shopping for the border, binding, and fabric for the leaves. Oh, and some more fabrics for the background. The fabrics I ordered didn’t have enough contrast. I ordered white on cream tone-on-tones. I’ll order some white on white to get the contrast I’m looking for. So on my December to do list is the 17 quad Log Cabin blocks, finish quilting Fading Charms and bind it, and quilt and bind Zigzaggy. And all that whiling doing all the Christmas prep. You think that’ll keep me out of trouble? For a month that I thought was not going to be very productive because I was called to jury duty, I really managed to accomplish way more than I would have thought possible even for a normal month. Turns out my jury duty consisted of sitting at the court house for a couple of mornings, and I was done. I didn’t actually have to sit on a jury. They were hearing child custody cases. I don’t think I would relish terminating a parent’s right to see their child, and that is mainly what the cases were about. So sad. My weekly goal of three Quad Log Cabin blocks was met with 15 blocks completed. I now have a total of 165 blocks stored in that nice big white box waiting for the remaining 27 blocks to be completed. I finished the last 5 placemats. Yay! So all of my Christmas presents that I am making are now done. In addition I threw together 3 throws and got them quilted. I used up all of the plaid and striped 2 1/2″ squares and strips that I had stored. I am so glad those are now done with. I also finished the Square Dance quilt top and have it loaded on the longarm. This is the first quilt I’ve made from the more feminine prints in that tub of 2 1/2″ squares and strips. An unofficial goal is to get all of them into quilts by the end of this year. And I made some progress on Fading Charms which was started before the 3 throws above and utilized a great many of those plaid and striped squares. Along with all this sewing and quilting, my husband and I shopped for a good used car for my brother-in-law. He is very happy with the car we found him. It is a 2001 Toyota Corolla LE with new lense covers on the headlights, a new headliner, four new tires, and a new armrest on the driver’s side door. And this clean little car only has 82,000 miles. Rob should get many miles of use out of it. Plus it gets very good gas mileage so should save him money there. That wraps up the beautiful month of October. I should finish all 5 of the quilts I have started during November. Wouldn’t that be fantastic?!! My weekly goal of three Quad Log Cabin blocks was met with 12 blocks completed. I now have a total of 138 blocks stored in that nice big white box waiting for the remaining 54 blocks to be completed. I’m almost ¾ done with these blocks. I sure will be glad when all 192 of them are done. Bet you will be too. I threw together a small quilt top that was to be hand-quilted with long stitches so that I would have something to work on while I was having Mohs surgery to remove a skin cancer. They use a local anesthetic for this type of surgery, and it is done in stages. They take a layer, test it while you wait in a comfortable waiting area, and then repeat as necessary. They tell you to bring something to help you pass the time. They got all of mine with the first layer so only had an hours wait so ended up finishing the quilting at home. Then I chose buttons to put in the centers of the blocks to represent flowers, put on a hanging sleeve, labeled it, and bound it. I’m very pleased with the result. Granddaughter Haylee has her great grandmother’s cedar chest which has a cushioned bench seat. 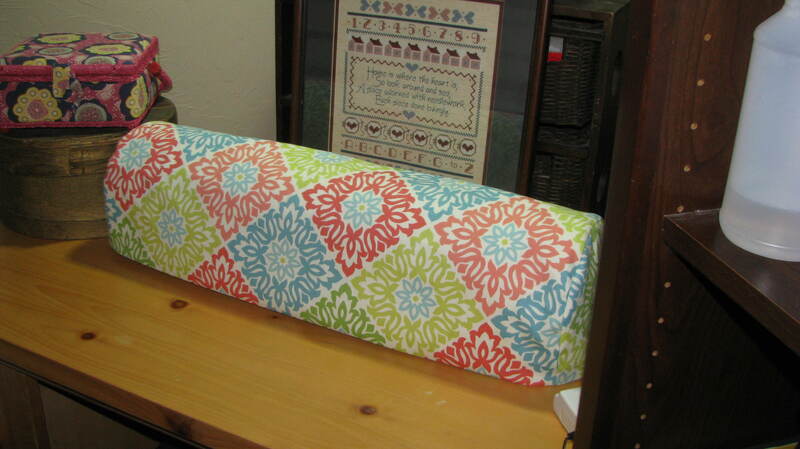 When she first received this chest, she and I re-covered it with Oklahoma State University That wouldn’t do in her new house, so she went back to JoAnn’s Fabrics and purchased more of the fabric that we covered her pillows with so we could replace that orange fabric. Doesn’t it look great?!! I’ve also been doing a bit of organizing this month. I decided it would be easier to find thread and buttons if they were sorted by color. Took awhile, but they sure look pretty. Easier to find what I need? You betcha! My husband helped me make a pressing board out of an old ironing board that he attached a piece of plywood to. Then he and I stapled one layer of Warm ‘n Natural batting and canvas to it. See how nicely a fat quarter fits on it. I sure do like it. Finally got back to the Pumpkin placemats and finished three this month. Just 9 more to go, and I am almost finished quilting the next group of 4. If all goes just right, I should finish all of the placemats by the end of September. I learned to use the embroidery module on my Bernina while I made 5 labels to go on quilts. One went on the back of a quilt I gave to my dad for his birthday a couple of years back. Don’t know why I didn’t already have a label on it. The other 4 will go on family quilts to indicate which grandchild gets what. One of those has already been attached to my Granny Wilson’s quilt. I also made a pocket to attach to the back of the quilt to hold all of the history that goes along with it. This quilt was made by her quilting bee back in the mid-40s. Each of their names went into the hat for a drawing. My great grandmother won. It was passed to her oldest, my grandmother, and then to her oldest, my dad, and then to his oldest, me. It is going to my oldest child’s oldest. She is so excited that it will be hers one day. My husband and I also found time to go to some garage sales one day. We found a nice little drop-leaf table and four chairs that will go to another granddaughter, Rylee. She recently moved into her own apartment and does not have a dining table. She and her mother will paint the set and make them hers. Not a bad buy at $25. I’m surprised at how much I got accomplished this month. I hope September proves to be as productive.